Grenoble is the Skoda of France. It is practical, reliable and efficient, but it’s never going to win Car of the Year, or many other prizes for that matter. However, just like those single-minded consumers who shunned others people’s advice and bought themselves a Skoda, I too took the path less trodden and bought myself a flight to Grenoble. My immediate feelings of disappointment and doubt are undeniable as first impressions bore no resemblance to my romantic notions of a croissant-filled, sophisticated life in a quaint little French town. However I soon discovered that Grenoble does have a little je ne sais quoi about it and is in fact more than just a pit stop on the way to Val d’Isère. The “Big Cheese” may be the highlight of Edinburgh’s Fresher’s Week, but it ain’t got anything on Grenoble’s psychedelic Erasmus foam party, located 20 minutes outside the city centre. Whilst drowning in a sea of foam, I made my first set of questionable friends. I introduce you to Alejandro, a 45 year old Mexican mature Erasmus student and Eduardo, a charming Brazilian who arrived in Grenoble ten years ago and never left. 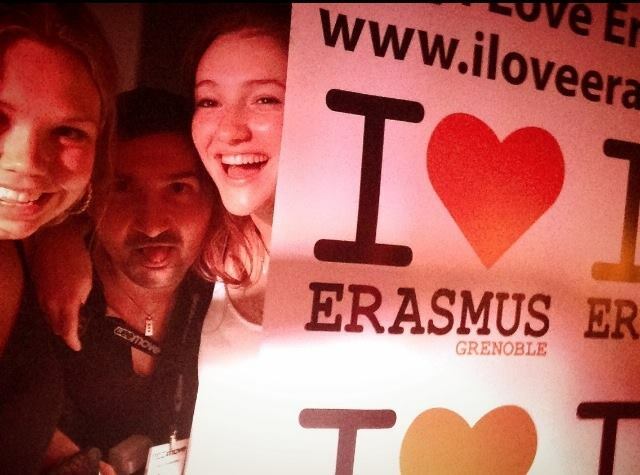 People live for Erasmus. It is like a double-sided badge of honour, which you wear with both pride and shame. While it guarantees entry into an international friendship group, it also ceases any pursuit of an authentic French experience by ensuring that you socialise with everyone except those of French origin. My first week was pretty grim. Not only was I living out of a suitcase in a questionable TripAdvisor ‘Hotel’ but I also spent more time than I would like to admit, staring at a computer screen on the ‘find a roommate’ version of ‘match.com’. Profile: Sophie Reynolds: Lonely, ginger English girl in search of a kind and loving home. Thankfully my week of living off tarts from the local patisserie came to a welcome end and I was taken under the wing of Famille Lacour. Finally out of my comfortable Erasmus surroundings, I was exposed to my first true experience of French culture. My first night of wine and cheese became a sort of initiation and I was only deemed acceptable to the family after being spotted reaching out for seconds of the particularly pungeont Roquefort cheese. Coupled with a few glasses of Cote du Rhone, my pursuit of an authentic French experience suddenly became more tangible. My next downfall was mistakenly thinking that I had perfected the art of appearing engaged in French conversation without any vague idea what was being discussed. Much alike to the Churchill nodding dog, I naively assumed that enthusiastic smiles and the occasional “oui” was the way to breeze through any situation I didn’t understand. Much to my dismay, it was only last week that Jean-Marc, the father of the family that I live with, pointed out my immense acting flaw: “Sophie, I always know when you don’t understand somezing, because you always laughs at me, even whenz I don’t make zer funny joke .” Who knows what my lecturers must be thinking when they see the foreign girl, grinning eagerly at them from the back of the class while they try to discuss the challenges of world poverty.